For many Suzuki (measure: 240 / 89 / 110 / 3-holes). See picture / list! 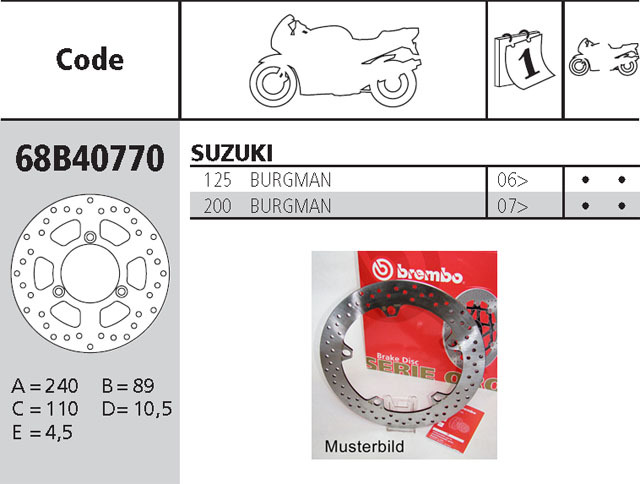 For many series bikes Brembo is offering now - for front and rear - Performance brake discs type Serie Oro. This discs are 100% interchangeable with the original standard discs. Ultra-close manufacturing tolerances and selected machining cycles guarantee flatness and concentricity. Optimum function in combination with the Brembo - brakepads (other TÜV-approved pads are possible without problems). The delivery (1 disc) is done in the "Brembo" - cardboard, complete with Brembo - manual. You may need screws are not included.